piFLOW® conveyors handle everything from bulk powders and granules to delicate tablets. Taby, Sweden – Regardless of whether they are used for baking goods, confectionery, instant food, food additives or nutraceuticals, piFLOW® vacuum conveyors meet the demands of the global food industry. Offering low noise and contained conveying, ATEX certification, compliance with FDA and EU 1935/2004 regulations, as well as fulfilling current Good Manufacturing Practice, the conveyors ensure a safe working environment and problem-free, highly productive operations. Featuring a small footprint with flexible routing of pipelines, Piab's conveyors save space and are easy to move. A hygienic design makes them easy to clean and maintain, enabling quick changeover times and contributing to greater process uptime. Fitted with special features to mitigate segregation issues, they also guarantee safe and reliable production involving active ingredients. 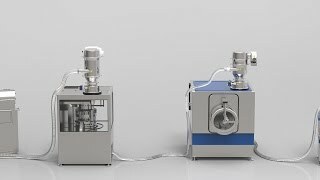 Three models are available for the food industry; piFLOW®f serves the basic food industry, piFLOW®p targets premium applications, and piFLOW®t handles tablets and other fragile products. A comprehensive range of accessories complements the conveyors. This includes Suction pipes that provide a lightweight and ergonomically correct solution for generally free flowing or granular materials, Feed nozzles for more challenging materials that allow the air intake to be adjusted for optimum mixture of conveyed material and aspirated air, and a dedicated Feed pipe for piFLOW®t. Also available is a Bag dump station with a special dust collector and an internal volume of 100 litres (3.53 cubic feet) that is able to handle four small bags simultaneously. Feed adapters for optimal flow are also included, as well as a special Feed station for piFLOW®p/t, featuring an optional fluidising function based on two points for extra carrying air for non-free flowing or other challenging materials. A Feed adapter with generic or Piab specific interface provides additional scope for adjustment.